Designed to meet FAA specification L-823, style 4, each kit forms a plug for two single conductor cables for connection to a secondary receptacle kit or to an isolation transformer. Both cables must be the same size. 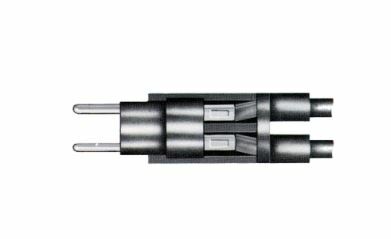 Designed to meet FAA specification L-823, style 11, each kit forms a receptacle for two single conductor cables for connection to a secondary plug kit. Both cables must be the same size. Designed to meet FAA specification L-823, style 5, each kit forms a plug for a two-pole conductor cable for connection to a secondary receptacle kit or to an isolation transformer. Designed to meet FAA specification L-823, style 12, each kit forms a receptacle for a two-pole conductor cable for connection to a secondary plug kit.